Leader of the Greek music orchestra Ano Kato. Music teacher and workshop leader. 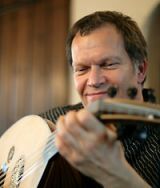 Michiel plays bouzouki (and other related stringed instruments), oud, guitar, keyboards, frettless bass, percussion and santouri.